Why choose the service of Locksmith Mill Creek? We are the best at what we do in our local area. We work with all types of locks and with all kinds of clients. We offer emergency help 24/7. Our service is based on professional attitude, experience and expertise, personal attention and customer care. We provide everything you are looking for and more at the most competitive prices. 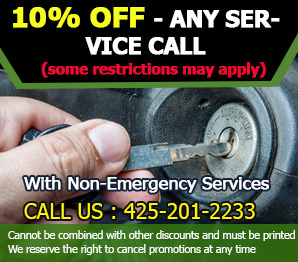 We specialize in the provision of 24 hour emergency locksmith services. We have experienced technicians who will arrive quickly and open the door in minutes. This is done without causing even the slightest damage to the door, to its frame or to any other fixture around. If you want, we can provide emergency rekey on the spot. With our comprehensive service, you will not only enter your home almost instantly but will enjoy the same level of safety as before right away. At "Locksmith Mill Creek", we offer professional services to both residential and commercial customers. Our auto locksmith services are highly valued and widely used as well. If you cannot get into your car or start the engine, we will provide assistance right away and fix the problem effectively. In addition to providing the fastest emergency lockouts, we offer rekey and new lock installation services to all customers. We install the most complex of locks and deadbolt mechanisms. With us, you can enjoy perfect security in your home and office. We offer the most efficient and reliable installation services that you can find in the local area. You can trust us completely with security door locks as well as with the locks of filing cabinets. You can now like us on Facebook to get more detailed information about our services. You will also be among the first to hear about our new offers and deals.